Upper and Lower Leland Ponds are 46 and 55 acre eutrophic lakes located in the Town of Eaton, Madison County. Both ponds are glacial kettle holes but their size and depth was increased by the construction of a 15-foot high dam at the outlet of Lower Leland during the 1830's for the purpose of supplying water to the Chenango and Erie Canals. Physical Features: Upper Lelands Elevation: 1200 feet Area: 46 acres Shoreline Length: 1.2 miles Length: 0.45 miles Maximum Depth: 50 feet Town: Eaton Lower Lelands Elevation: 1200 feet Area: 55 acres Shoreline Length: 2.2 miles Length: 0.5 miles Maximum Depth: 40 feet Town: Eaton Aquatic Plant Life: Both ponds have significant rooted aquatic vegetation growth around much of them out to about 15 feet of water. 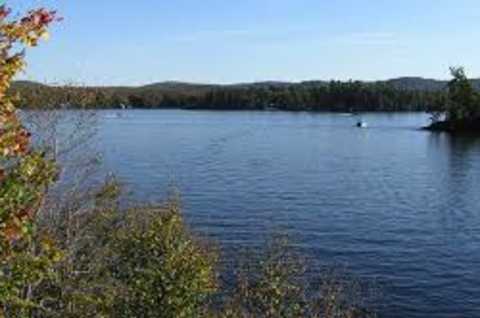 Access: Upper Leland Pond - On Route 26, approximately one mile southwest of the hamlet of Bouckville. Concrete launch ramp. Parking for 10 cars and trailers. Universally accessible fishing pier. Lower Leland Pond - Undeveloped hand launch, across from Upper Lelands parking area. Fish Species: Largemouth bass, smallmouth bass, chain pickerel, tiger musky, brown trout, black crappie, pumpkinseed sunfish, bluegill, redbreast sunfish, rock bass, yellow perch, brown bullhead, common carp, golden shiner, creek chubsucker, and alewife. Fishing: Upper and Lower Lelands Ponds are connected by a channel that runs through a culvert under the highway. This culvert is too small for boat passage, but it does allow fish movement between the ponds. 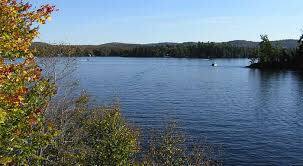 Upper Lelands offers a cold water fishery for brown trout along with warm water gamefish such as largemouth bass. Lower Lelands is shallower and weedier and offers a better opportunity for largemouth bass. Largemouth bass in the 12 to 15-inch range are regularly caught, with some 20-inch fish caught each year. Panfish are abundant but fish in the 8-inch and larger size are uncommon. Though tiger musky are stocked, they are infrequently encountered. Alewife are one of the main prey species in both ponds.